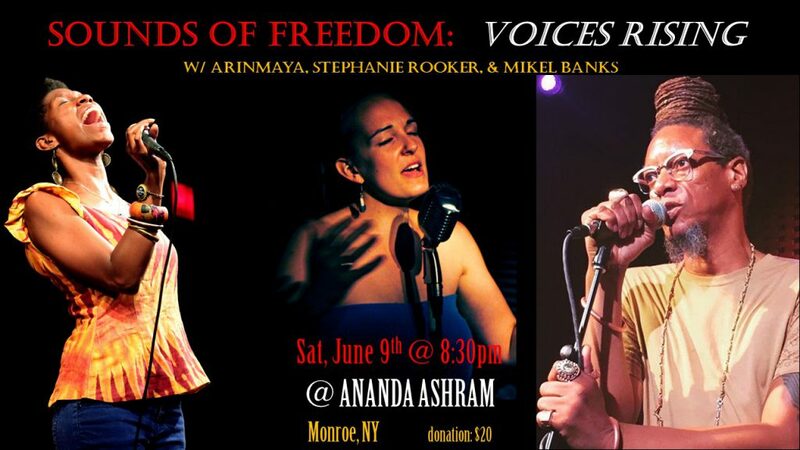 Stephanie Rooker is a musician, voice teacher, sound healing facilitator, and founder of Voice Journey Sound Center in Brooklyn, NY. Her teaching & performing integrates practices of deep listening, somatic awareness, and mindfulness with vocal sound and music to awaken the medicine of the voice for creative expression, personal growth, and holistic well-being. Arin Maya is a genre-bending artist stretching between soundscaping and soul/folk/jazz/gospel-inspired croonings and eco-eclectic accessory design. She’s one of the headliners for The Experi3nce – a dynamic 5-piece musical collective that colorfully blends the universality of Hip-Hop, the surprise of Funk and Jazz, and the simplicity of R&B/Soul to bridge generational and cultural gaps and excite audiences in Brooklyn and beyond. Mikel Banks has been performing with a wide variety of artists for many years, as a vocalist, musician (digital horn, harmonica, percussion & flute), actor (Beyonce & Jay Z videos), storyteller & teaching artist. He is currently performing with the Burnt Sugar the Arkestra Chamber, Digital Diaspora, the Roughstars and the Dustbin Brothers (Mikel’s DJ duo with IncogNegro Michael Adams). His new project, “Mr. Mikel’s Tot Rock & Reggae Experience” (ABC’s, 123’s & Positives for Pre-Schoolers & 1st Graders), is an outgrowth of being a pre-school music teacher. Concert preceded by Meditation Program beginning at 7:00PM (by donation).